My wonderful 10-year old son came home making this ornament and was so very happy with it, that we did another together as a family. He showed me and his brother how to make this craft and we will show others since it is a craft that you can do with your son or daughter or niece or friend – it's a craft for a family to do together. And, every year that you hang this snowman on your tree, and whoever sees it and asks you about it (and they will because it is a very cut ornament) you will tell them how you worked together to create it and you will relive these wonderful times together as a family. What can be more special that an ornament that reminds you of a time with family! You'll need white paint, black paint or a black marker, one orange marker, a black pipe cleaner, 1 toothpick, a small piece of white (or other color) ribbon and some hot glue. First, paint the glass portion of the light bulb white. 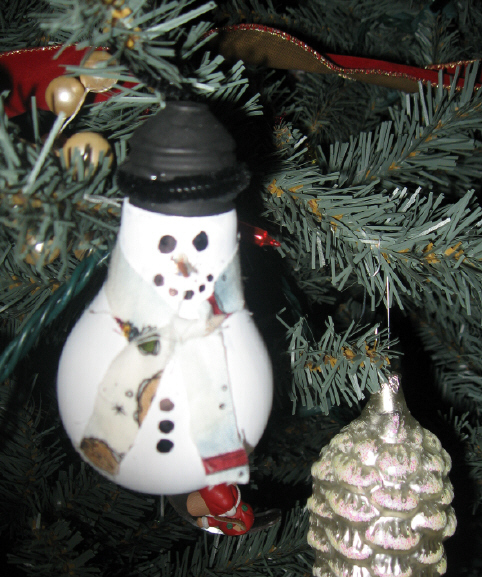 Next, paint the silver screw in top black (or you can color with a Black marker)—this is the snowman's hat. Now, using a marker, make two eyes and a dotted mouth on the bulb below the hat (this will be the snowman's face) Paint a portion of a toothpick orange, break off or cut about 1/4 inch and hot glue this to the bulb under the eyes and above the mouth to make his "carrot" nose. Next, glue the ribbon under his mouth. This is his scarf. You can also use maker to decorate the ribbon if you wish. Add a few "black marker" buttons down his body. Finally, take a black pipe cleaner and hot glue it where the white bulb and black screw top meet—this is the brim of his hat. Allowing the remainder of the cleaner to hang off. You can bend this portion up and make a hook at the top—this is to hang on the tree. All supplies are easy to find in any store. Enjoy doing this craft with your child. Copyright © 2008 by Judy Howarth. All rights reserved.